Jeannette Bessinger is a Board Certified Holistic Health Counselor/Nutritionist Author, award-winning motivational educator, and creator of the Whole Life Nutrition approach. In Whole Life Nutrition, Jeannette combines the best evidence-based allopathic strategies and the most powerful eastern tools in a highly effective approach to making permanent lifestyle changes. 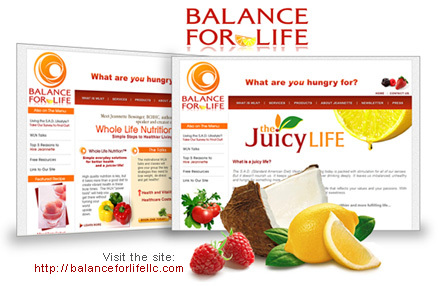 We believe we've created an effective showcase for all that Balance for Life has to offer. We also created logos for each "arm" of BFL — including one for The Juicy Life (the newsletter) and one for Jeannette's personal endeavors. See our logo design page to view them.